When pondering bed solutions, I realized that using the same materials, I could create a modern, fresh, E-A-S-Y, and cheap headboard. 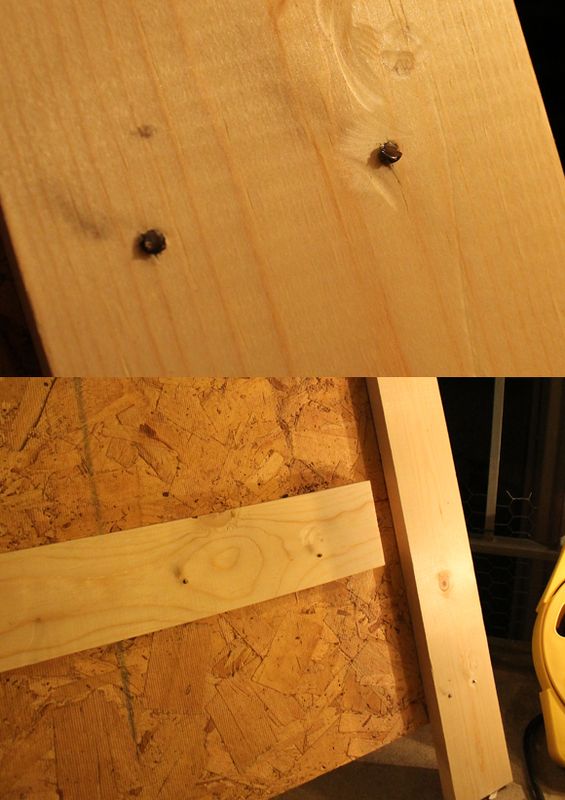 I got some leftover plywood (the type I used is technically called OSB, or oriented strand board) from my dad’s garage–these pieces were actually left over from when my parents’ house was built in 1999. Vintage! This kind of wood is normally used as a subfloor or other non-finished construction material. 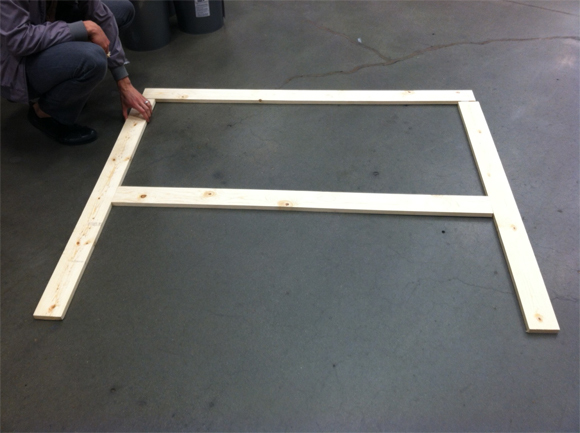 The goal was to make a headboard 60 inches wide (queen size) and somewhere around 4 feet tall. 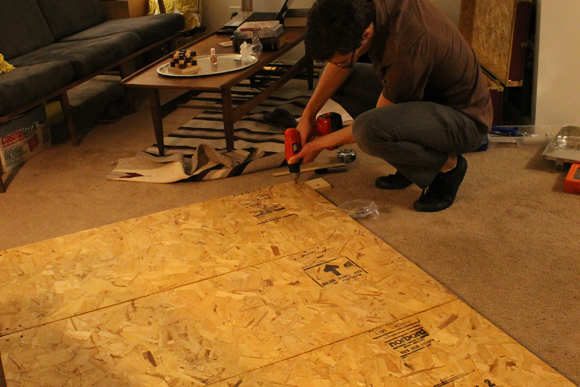 As luck would have it, the boards my dad gave me were in 20″x48″ panels which means we had no cuts to make whatsoever! We did have to drop about $12 at Lowe’s for the other lumber. 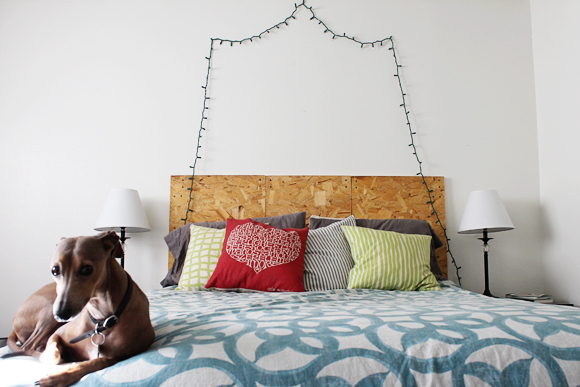 I will not say no to a $12 headboard. Note: we had already been to the hardware store twice that day and did not want to go out again to buy the appropriate length of screws. 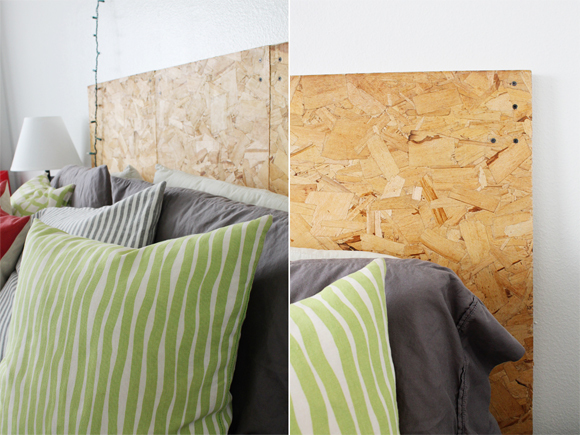 The drywall screws we used were too long and stuck out the back of the headboard!! I took this opportunity to break out the dremel tool we have had for several years and use the heavy duty cutter attachment to cut off the ends of the screws that were sticking out. Disclaimer: I do not recommend doing this unless you have a workshop. I did this on the apartment patio and it kind of scared the pants off me. So as not to damage the walls, since the screw tips were still not flush, we covered the tips with two layers of painter’s tape. Another good option (that I still might use) is felt circles–the adhesive kind you can put on chair legs so they don’t scratch the floor. Enough blabbing, let’s see some “after” shots! I love the deconstructed concept and the pattern and texture the particles of wood have. The warm, cheery tone also plays well with the pillows and comforter. I know that it’s definitely not going to be everyone’s cup of tea, but I decided if I couldn’t afford a real, grown up headboard right now, to head in the totally opposite direction and do something funky and exciting. I mean, I’m not getting any younger, right? 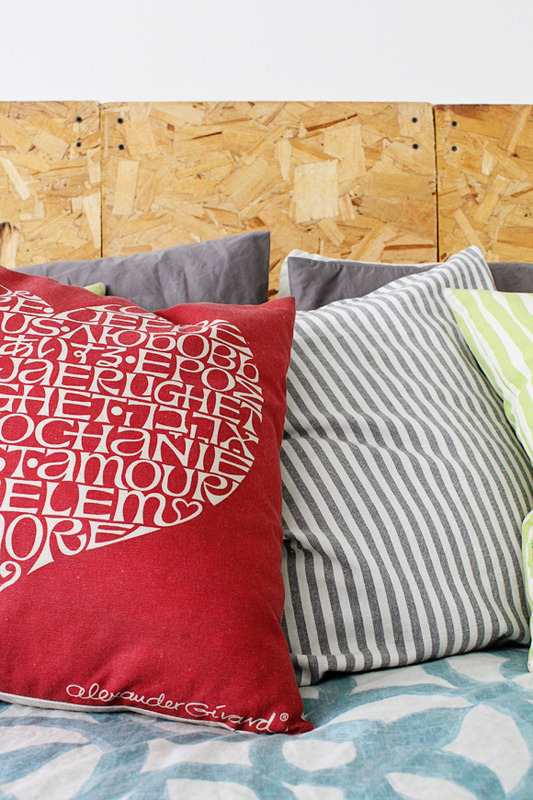 Now the big question is… what to hang over the headboard? Ideas? 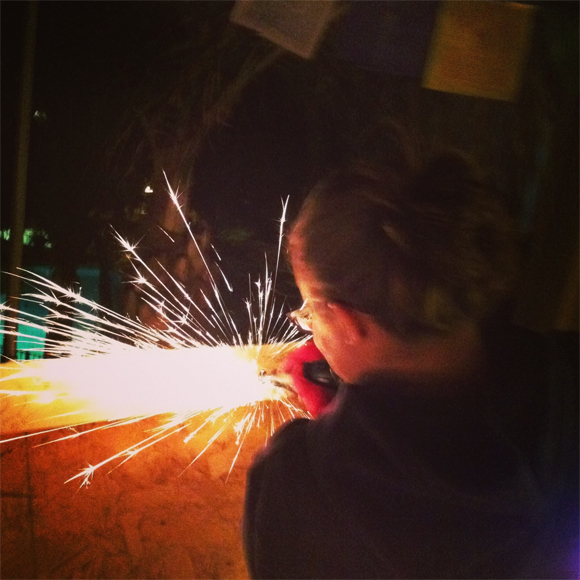 PS: More OSB love here… In all truth, I found that article through Unhappy Hipster. Great idea! love the look. Very UO! Thank you! Amazingly enough, it turned out exactly like I envisioned it. That doesn’t always happen! !